Cool, probably low 50s, perfectly clear, still. K told me about 2 fairly nearby hardware stores, south on Wyoming Ave, the first about 1 mile, an Ace store a little further. The first, named appropriately Wyoming Hardware, was closed, maybe permanently, couldn’t tell. (The nearby Arab bakery also looked closed and sealed.) The second I learned was closed for good. The men in the check cashing store where I learned this information (maybe Arab, but they didn’t acknowledge my black t-shirt, bought in Gaza, with Naji’s cartoon character and the word Palestine) informed me that the store next to theirs sold Internet cables. That store, staffed by a young white man languidly watching an old basketball game on TV, was filled with junky electronics of all sorts, radios, etc. Yes, I have a cable. $10, he said. Searching for a store which offered key cutting, the 2 Arab men told me of a third store, near the intersection of Joy and Wyoming. Here I found the same cables for $1 each. I bought 2, 1 for K and 1 for me. Thinking, I’ll try them all, and if they all work, I’ll return the $10 cable claiming it is not suitable. Or maybe simply keep it, contribute to the local economy. The Detroit point here is first, store closings. Second, linked with the first, lack of strong commerce. Third is good will. I find good will in Detroit everywhere I look, so far. 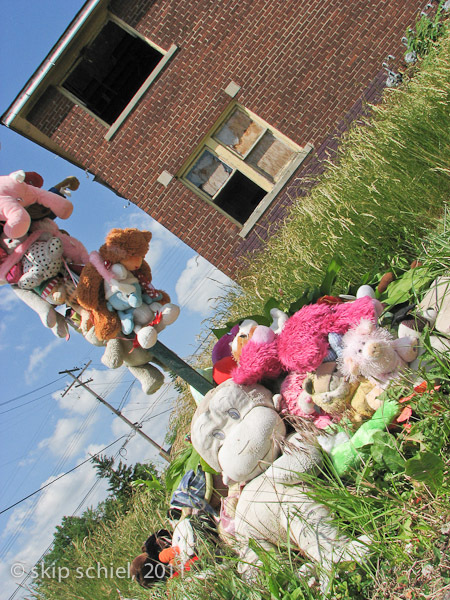 Contrasting with the lousy store situation is the garbage pickup, another scene in the Detroit story. The garbage crew consisted of 3 sets: first a compactor truck with an arm that lifts containers high, tilts them, and dumps the contents into the truck’s gaping belly. All done by controls in the cab by one operator. Not much future for garbage collectors. Second a standard compactor truck picks up yard waste for composting. I saw the composting facility last year, not far from the river. I watched both operations. We weren’t quite finished with trimming and collecting branches when the second truck rolled up. A man greeted us, large and black, waited patiently as we towed our bags to the truck. And finally, unseen by me, third, the final episode in this routine, another truck collected what was on the ground and not in containers—years of family memories. While engaged in all this, observing the interchange of neighbors, I thought, how about a series of portraits of neighbors? Begin with Gloria, then Johnny, the grandson down the street, his grandpa, and others that I might meet thru K and on my own. Before K left for Ann Arbor last night I’d intended to try this idea with her. But she is now in Ann Arbor. We promised to connect by phone once per day, I can ask her then. Last night before leaving for Ann Arbor she brought me belatedly to a meeting at the Traffic Jam and Snug restaurant (odd name I realize) of the local chapter of a national Jewish organization working for justice and peace in Palestine-Israel. We sat in on the final minutes of an energetic planning and report meeting. BDS with respect to TIAF Cref was one theme, to join with the national call for “flash mob” actions this summer. They also discussed joining a labor rights’ organization. The 2 might join together, each supporting the other. This represents a broadening of perspectives, alliances, and actions, perhaps boding well for the future. And perhaps also part of the groundswell of grass-roots activism occurring world-wide, at least partly inspired by the Arab Spring. Later I met Jimmy, the famous Jimmy of the Israel Committee Against Home Demolitions fame, who, he told me, is originally from Michigan, lived many years in Israel, is Jewish, moved here, and now offers himself to congregations for discussion about the situation. He is also a fellow biker. Big guy, with a black beard and wisp of an accent. I chatted with Barbara also after the meeting, learning that up to this point the FBI has not yet targeted local activists. She looked horrified when I told what had happened to Alice R, that frightening knock on her door. After she learned about my new Female in Palestine photo set she suggested I contact Alice because Alice focuses on women. Cool, low 60s, overcast with some slight cloud definition, hazy or foggy, still. After an evening and night of light rain. Dreamt: with 2 friends we were at MIT hoping to catch the last lecture by a famous economist. Many gathered into a large room to be picked, not all would be able to enter the lecture hall. We sat in front, near the woman choosing. She pointedly overlooked us, even tho we waved our hands for attention. Was this because of our politics, or for more personal reasons? No resolution to this. Later one of my friends opened a door to a huge cavernous room, bare of all furniture, echoey. Typical MIT, someone said. Yesterday was the bike ride, my first long ride I’ve taken on this journey to Detroit. A triangle: south on Wyoming Ave to Michigan Ave, east on Michigan to the old train depot, further east to downtown, then the hypotenuse—northwesterly on Grand River Ave. About 15 miles in 4 hours. Aiming at the old train depot I also discovered a nearby, mostly abandoned industrial complex. 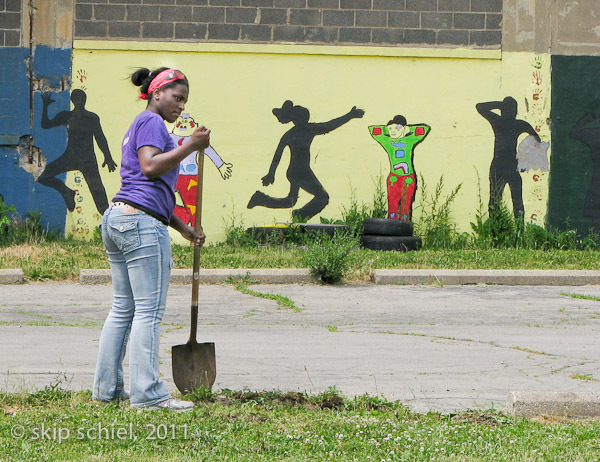 A group of about 6 young folks, all white except for one black woman working by herself digging with a shovel along a driveway, were weeding small garden patches planted by a nearby church. They were part of a summer project with the word rescue in it. Mostly to offer summer camp to local youth who I assume would be black, they were novices or newly hired and given a taste of this sort of life by performing this mission—rescuing the garden from weeds. 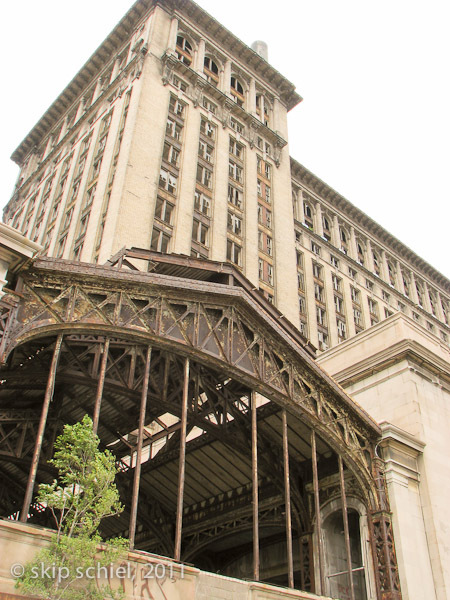 The old train depot, officially named the Michigan Central Station—whose history I will have to research—is gargantuan. It consists of the station proper, built of stone, about 2, maybe 3 stories high, with columns, and an office complex rising above the station. Constructed from bricks, the office section soars to maybe 20 stories. Most windows are broken and I learned that the owner, Manuel (Matty) Moroun (who also owns the bridge to Canada), is replacing windows, perhaps with the objective of converting to condos. The backside of the building, presumably where it joined the tracks, was confusing. How did the tracks orient to the station? Some of the configuration might be lost by later changes and some by plants growing in, covering the original design. I managed to explore most segments of the exterior, making use of my bike mobility, and photographed extensively. A young woman and man, she black or perhaps Asian, with very long black hair, were separately photographing the building. As I stood in front to frame a photo of the crane against the building, 2 young men approached me to ask what I knew about the depot, how to enter. They told me that many of their friends had been inside, one all the way to the roof. I spotted some graffiti. Was window breakage an inside job? I told them the little I knew—maybe condos, replacing windows—and suggested Wikipedia might be a good source of info. Roosevelt Park joins with the station to create a large open vista. 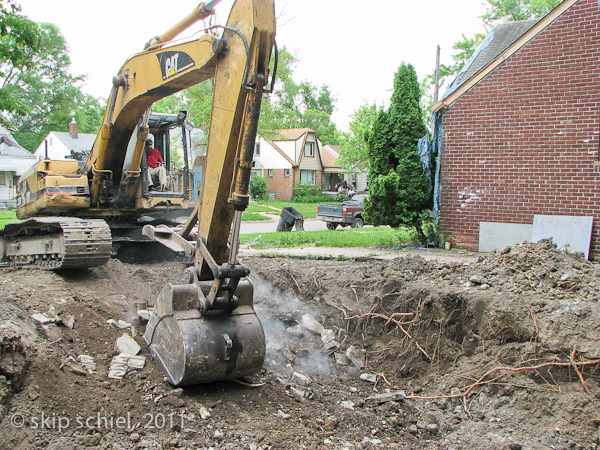 When Winkie and I drove by on Monday we spotted what looked like an archeological crew digging and sifting. A few abandoned buildings dotted the landscape. The postal service has its maintenance headquarters nearby. Along Michigan Ave I stopped at a Goodwill store and found a bike helmet for $3. 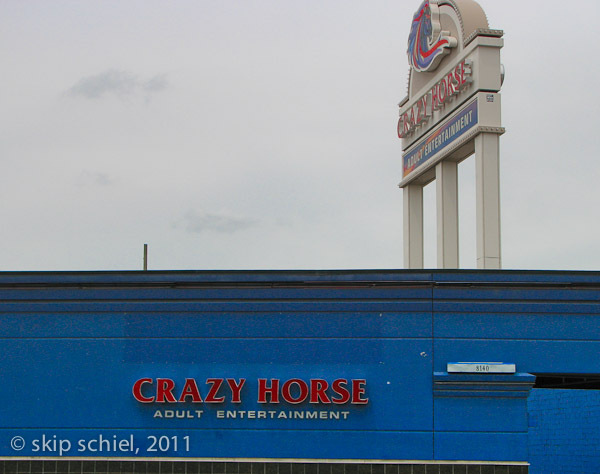 Nearby I noticed a series of adult entertainment emporia, one named Crazy House. I photographed it as a fat man conveniently lumbered by. Reaching downtown, still on Michigan Ave, I stopped in a small shop advertising hats and shoes. Thinking they might carry a version of the skipper’s cap I’m wearing and wearing out, from China, perhaps a gift from Katy, I asked. No, nothing like that, nothing from China. I was wearing my orange biking vest, carried my helmet, had a clip around one pant leg and this must have tipped the proprietor—a black man with a Caribbean accent—to at least deduce my mode of travel if not also an aspect of my basic nature. He asked, how far are you riding? About 20 miles (later, examining the map, I scaled down my claim.) Where? I told him. He then said, I ride 30 miles every other day. Inner Detroit is best for biking, drivers respect you. Out as far as 8 Mile Road. Then they get aggressive. How about Dearborn? I asked. Aggressive. For a long ride I’d suggest Ann Arbor, took me 5 hours round trip, to visit my son at the university. And he then outlined the route. I’m tempted, but doubtful. When I arrived home about 5:30 pm my next door neighbor, Johnny, an ebullient soul with a long grey hair tail, asked, how far did you ride? I told him and then added, I’d much prefer riding your horse. He seemed impressed with my mileage. He and his brother own a horse. My doc asked me not to ride this year and I’m honoring that, he stated. He didn’t explain. McDonald’s is proving more than adequate for my Internet work (I lack it at home). It is jolly, many people meet there. I might explore photographing the patrons. Several times yesterday—the haberdasher and Johnny—I thought about the portrait series I’m contemplating. Long in gestation, maybe this is good. Or maybe I’m just shy. Cool, low 60s, dry, clear, still, full moon. After a confusing planning session with my host, K, what transpired finally was a moderately long late afternoon bike ride to Dearborn and the Arab American museum, plus a stop at the New Yazmeen bakery (for a tawook sandwich and date cookies) that I’d discovered last year. The morning had been foggy and dark. As I left the house for the ride, rain fell. I retreated, donned rain gear, and headed out. The museum is very well done, large, clearly presented. Displays show how Arabs came to America, from where, during when, how they live now, and what they’ve contributed. There is a large central indoor courtyard with displays on the periphery. Other rooms host conferences and workshops. I could imagine making a photo presentation here some day. Only a few other people were in the museum while I was there. 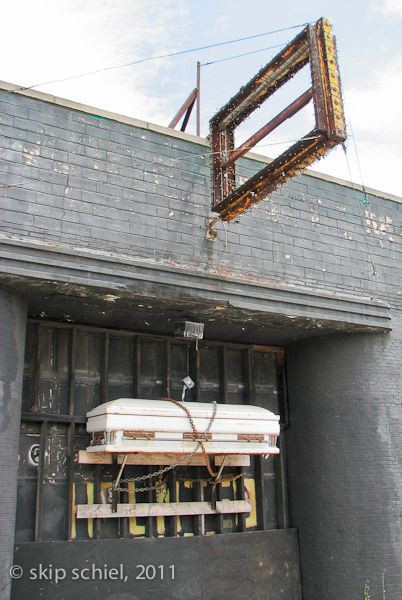 I suspect it is not high on tourists’ lists of favored sites to see while in Detroit but it represents one of the most important developments in the city’s history. Detroit has one of the highest concentrations in the country of Arabs. Initially drawn here by manufacturing jobs (I believe), they established a presence which drew others. With the collapse of the auto industry (and its possible rebirth) I might ask what Arabs do now for money. How linked are they to the failing economy in the nation and especially the hard hit state of Michigan? On the way, I stopped at a Lebanese-owned bike shop in Dearborn to raise my bike seat. Equivocating, the owner finally charged me nothing, saying, if you have lots of money the charge is $2.50, if not it’s free, next time. I’d flung around a few Arabic words, shukron and marhaba, ending with masalama. This might have prompted the warm reception. Biking off I also wondered why I’d not asked to make their portraits. Did I miss a rare opportunity? Or was something not quite right—the light, the scene, the people, the timing? 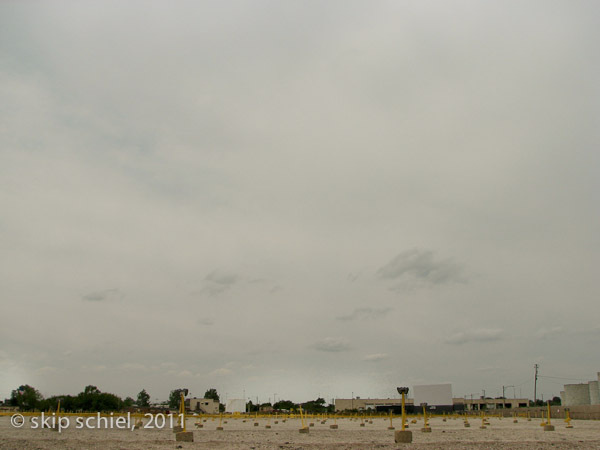 I continue to ponder the idea of a portrait series, maybe beginning with the neighborhood and spreading out. I’m not quite ready to begin. Another idea occurred to me yesterday while reading the weekly Metrotimes (which I found at the museum, nowhere else): the Eastern Market. In an interview with the director about his plans, I thought, this might be an interesting lever for showing Detroit. The market is vibrant on Saturdays, but mainly wholesale and a few tourists during the week. The director, Dan Carmody, is eager to expand operations—thru renovation of buildings, better promotion, and an improved regional food network generally. 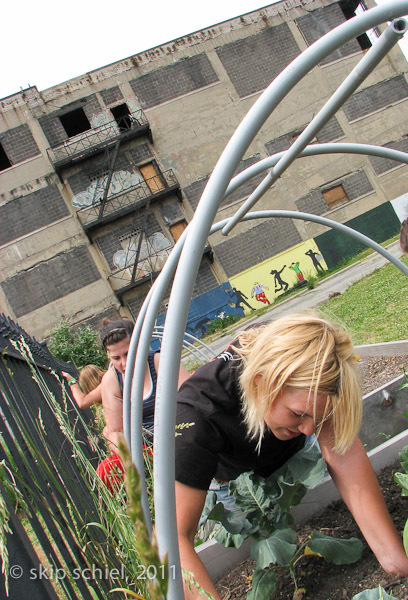 All very far-reaching and connected to urban gardening and farming. I plan to visit the market on the first possible Saturday (if not earlier), which might be 1 week off. My photo ideas are sometimes very slow to develop. Meanwhile what do I photograph without a guiding idea? McDonald’s heats up late morning. Yesterday, above the din of the music system, suddenly more music, submerging the existing, poured forth at increased volume. Bob Dylan, the Beatles, and others. I eventually learned someone was setting up audio equipment for some sort of event, maybe connected with gospel singing. I might have stayed around to explore and possibly photograph but again I didn’t. Why not? Not quite ready. By late morning, around 11, many had left. Is this the pattern? Early morning confab, split before lunch?